I'm enjoying watching the events going on in England for the Queen's Diamond Jubilee. I thought that I would take a look back at Coronation Day here in Winnipeg and see what it was like. It sounds interesting but, unfortunately, I cannot find any photos of the day on any of my usual places so here it is through newspaper clips ! Queen Elizabeth ascended to the throne upon the death of her father King George on February 6, 1952. The twenty five year-old princess was actually in Kenya at the time of his death. 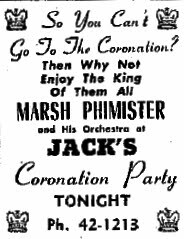 The day of her official coronation was set for Tuesday, June 2, 1953, giving people time to mourn and for cities throughout the Commonwealth - including right here in Winnipeg - time to prepare celebrations. Manitoba was familiar with Elizabeth II. Just four months earlier she and Prince Phillip took a 33 day tour of Canada that included a day-long stop in Winnipeg. The couple visited Deer Lodge Hospital, the city halls of St. James, Winnipeg and St. Boniface, then a state luncheon and a concert at the Auditorium. In February 1953 she granted "Royal" status to the Winnipeg Ballet, who performed for her during that visit. Most large retailers and banks closed for Coronation Day, which despite the time difference was Tuesday, June 2. City Council declared it a civic holiday for their employees. It seems that schools, too, were closed - they held their coronation events on the Monday. Festivities began on the eve of Coronation Day with a concert at the Auditorium. The highlight of the event was a special Coronation Cantata written and conducted by Walter Kaufmann, conductor of the Winnipeg Philharmonic Orchestra. If you couldn't get into the official concert, many dance halls and night clubs took advantage of the mid-week holiday and held their own supper dances until the wee hours of the morning. The largest event was coronation parade. Thousands jammed the streets for the biggest parade Winnipeg had ever seen. The procession, which included 20 bands, took two hours to wind its way from Higgins and Main to the Legislature. The media, of course, provided complete coverage of the event. Most local radio stations covered the event beginning at 4 a.m.. CBW (CBC Radio) didn't bother signing off the air Monday night, they just went straight through with special coverage. The Free Press had a couple of jubilee special editions. A "special" special edition was printed when a chartered plane arrived with photographs of the morning's events from London. Though this was the first Coronation to be filmed Winnipeg didn't have a local television station yet. The RCAF's Operation Pony Express rushed the film to Canada where it was broadcast by CBC television (27 minutes ahead of NBC in the U.S.) then copied and distributed across the country for showing. It opened in theatres the following week. Eaton's ad, also see a photo of Eaton's Winnipeg window display. Events didn't end on Coronation Day. Throughout the summer there were concerts, banquets, dances and other events celebrating the coronation. Here's the BBC's look at how Coronation Day played out in England. I marched in the parade - one of the large contingent from the R.C.A.F. station, where I was an R.A.F. Officer-Cadet learning navigation. Some way ahead of us was the Central Band of the R.C.A.F. As we approached the saluting-base this band gave a fine rendering of the Royal Air Force March. All of us were marching smartly, in step. But rather unfortunately the Band of R.C.A.F. Winnipeg was close behind us. At the crucial moment, they began playing (badly) the only march in their small repertoire ( a tune which I cannot forget). The result was chaos - or so it seemed, as we lost step and found it hard to keep our composure!